LCD stands for "Liquid Crystal Display". LCD technology has been with us for several decades and is used in a variety of video display applications, including panel displays on electronic instruments and consumer electronics devices, as well as digital signage. Perhaps the most familiar use to consumers is their use in TVs. In TVs, LCD chips are arranged across a screen surface and using a backlight (most common type is LED), LCD TVs are able to display images. Depending on the TV's display resolution, the number of LCD chips used can number in the millions (each LCD chip represents a pixel). In addition to TVs, LCD Technology is used in many video projectors. However, instead of a large number of LCD chips placed across a screen surface, a video projector utilizes 3 specially designed LCD Chips to create and project images on an external screen. The three LCD chips each contain the same number of pixels that equals the display resolution of the projector, with the exception of pixel shifting techniques used in some video projectors to display a higher resolution "4K-like" image without having the required number of pixels. One type of LCD video projection technology used is referred to as 3LCD (not to be confused with 3D). In most 3LCD projectors, a lamp-based light source sends out white light into a 3-Dichroic Mirror assembly that splits the white light into separate red, green, and blue light beams, which in turn, pass through an LCD chip assembly that consists of three chips (one designated for each primary color). The three colors are then combined using a prism, passed through a lens assembly and then projected onto a screen or wall. Although lamp-based light sources are the most used, some 3LCD projectors may employ a Laser or Laser/LED-based light source, instead of a lamp, but the end result is the same - the image is projected onto a screen or wall. Although 3LCD technology is one of the most commonly used technologies in video projectors (along with DLP), there are some LCD-based variants. These variants are LCOS (Liquid Crystal on Silicon), D-ILA (Digital Imaging Light Amplification - used by JVC), and SXRD Silicon Crystal Reflective Display - used by Sony). All three combine some of the characteristics of both 3LCD and DLP technology. What all three variants have in common is that instead of light passing through the LCD chips to create images as in 3LCD technology, light is actually bounced off the surface of the LCD chips to create images. As a result, LCOS/SXRD/D-ILA are referred to as "reflective" technologies, whereas 3LCD is referred to as a "transmissive" technology. The same type of light source options (Lamp/Laser) used with 3LCD will work with these variants. One of the key advantages of the LCD/LCOS family of video projection technologies is that both white and color output capability is the same. This contrasts with DLP technology which, although has the capability of producing excellent color and black levels, cannot output both white and color light at the same level in cases where the projector utilizes a color wheel. 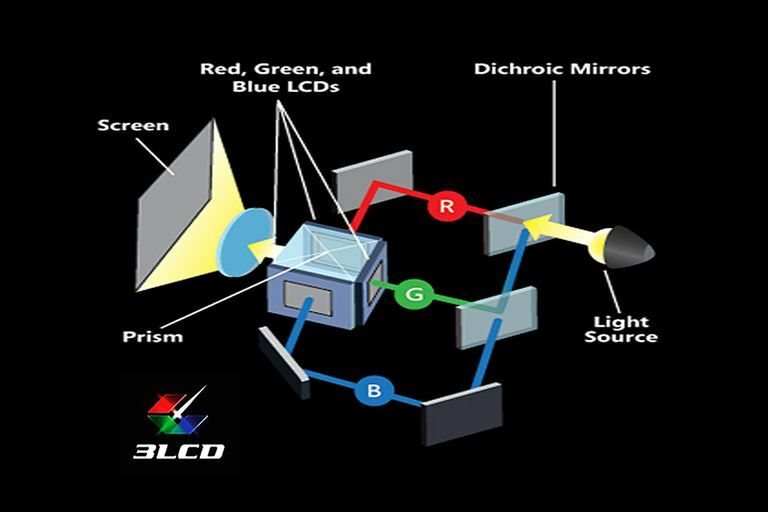 In most DLP projectors (especially for home use) the white light has to pass through a color wheel that contains Red, Green, and Blue segments, which reduces the amount of light coming out the other end. An LCD projector can exhibit what is called "the screen door effect". Since the screen is made up of individual pixels, the pixels can be visible on a large screen, thus giving the appearance of viewing the image through a "screen door". The reason for this is that the pixels are separated by black (non-lit) borders. As you increase the size of the projected image (or decrease the resolution on same size screen) the individual pixel borders are more likely to become visible, thus giving the appearance of viewing the image through a "screen door". To eliminate this effect, manufacturers use various technologies to decrease the visibility of the unlit pixel borders. On the other hand, for LCD-based video projectors that have high-resolution display capability (1080p or higher), this effect is not visible since the pixels are smaller and the borders thinner, unless you are very close to the screen, and the screen is very large. Another issue that can come up (although very rarely) is Pixel burnout. Since an LCD chip is made up of a panel of individual pixels, if one pixel burns out it displays an annoying black or white dot on the projected image. Individual pixels cannot be repaired, if one or more pixels burn out, the entire chip has to be replaced. Video projectors incorporating LCD technology are widely available, affordable, and practical for a variety of uses, from business and education to home theater, gaming, and general home entertainment. The Best Cheap Video Projectors (includes both DLP and LCD types). Best 1080p and 4K Video Projectors (includes both DLP and LCD types).